Born on 19 July 1904, Reynold Henry Hillenbrand was a priest of the Chicago Archdiocese. He mentored clergy and laity in the Young Christian Students, Young Christian Workers, Friendship House, the Cana Conference, the Christian Family Movement, the Catholic Labor Alliance, and the La Leche League. 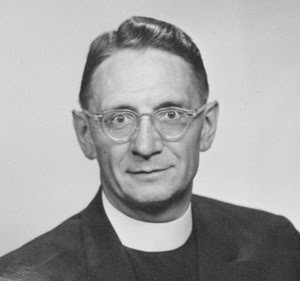 Hillenbrand championed the causes of labor and race relations, and brought the first women speakers, Dorothy Day, and later Catherine de Hueck Doherty, to the University of St. Mary of the Lake, his alma mater, where he served as rector from 1936-1944. Several of Hillenbrand's seminary students, including Alfred Leo Abramowicz, Romeo Roy Blanchette, Daniel Cantwell, Michael R. P. Dempsey, John Joseph Egan, Thomas Joseph Grady, George G. Higgins, Timothy Joseph Lyne, Eugene F. Lyons, Edward A. Marciniak, John L. May, Paul Casimir Marcinkus, Cletus F. O'Donnell, William J. Quinn, and James A. Voss, became influential in social action and/or in both pre- and post-Vatican II American Catholic affairs. He also played a prominent role in the liturgical reform movement. Fr Hillenbrand died on 22 May 1979.